A medium (up to 1,014 mm or 40" in total length) slender, tan or cream colored snake with two wide, dark brown or black, irregular-edged stripes on the back. The stripes are often marked with light flecks or mottling. The sides of the body and the middle of the back between the dark stripes are tan, peach, or straw yellow. An additional thin, dark stripe lines each side of the body on the seam between the 3rd and 4th scale rows (counting up from the belly). The belly is usually pale cream and is often tinted with pink or peach. The scale on the snout (rostral) is enlarged, triangular, and protrudes on the sides. The eyes are large, the pupils are round, and the scales are smooth. 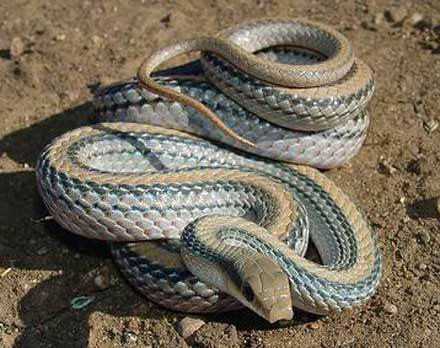 The irregular-edges and mottling of this snakes dorsal stripes and its additional side-stripes distinguish it from the similar looking Eastern Patch-nosed Snake which has solid, straight-edged dorsal stripes and usually lacks side-stripes. This snake is found across all of southern Arizona below the Mogollon Rim, the western edge of the state, and into the deserts of the northern plateau region. It occurs at elevations ranging from near sea level along the Colorado river to about 6,500'. It is found in flatlands, low valleys, rocky bajadas, foothills, and mountain slopes in biotic communities ranging from Arizona's low desertscrubs up into the woodlands. This alert and fast moving diurnal snake hibernates during the cold months of late fall and winter. It is primarily a ground-dweller but it occasionally climbs into shrubs. The Western Patch-nosed Snake actively forages for lizards, mice and other small mammals, reptile eggs, and birds. Mating takes place in spring and a clutch of up to 12 eggs is laid in late spring or summer. Hatchlings begin to emerge in July. BIG BEND PATCH-NOSED SNAKE Salvadora hexalepis deserticola. This subspecies usually has orange or peach coloration. DESERT PATCH-NOSED SNAKE Salvadora hexalepis hexalepis. MOHAVE PATCH-NOSED SNAKE Salvadora hexalepis mojavensis. The stripes of this subspecies are usually broken up and less distinct.